When Tom Telford helped found a vacation rental management company, Blue Creek Cabins, in 2001, he wanted a quick and easy way to connect with people looking to rent the 20 cabins he and his partner managed in and around the mountains of picturesque Helen, Ga.
That is when he heard about a program called AdWords being offered by a new company, Google. Finding the system relatively easy to use, Mr. Telford selected a few keywords, like “Helen GA cabin rentals,” and agreed to pay Google 60 cents every time someone performed a search and clicked on his ad. Before long, the calls and e-mails started pouring in. “The results were phenomenal,” said Mr. Telford, whose company is used by property owners to market their cabins. Encouraged, he invested more in his pay-per-click advertising efforts, which in time included similar programs offered by Bing and Yahoo. This concern has become increasingly common as online advertising has become a standard channel for large companies. Attracting those additional advertisers has been great for Google, which reported a 42 percent increase in paid clicks, year over year, for the second quarter of 2012. But the heightened competition has driven up the prices for keywords and made it harder for small companies like Mr. Telford’s. While about 96 percent of pay-per-click advertisers spend less than $10,000 a month, according to AdGooroo, a research firm that studies the pay-per-click market, big-budget advertisers spend hundreds of times more. In the first half of 2012, Amazon reportedly spent $54 million, and the University of Phoenix $37.9 million. “AdWords can bleed many a small business dry,” said Sharon Geltner, an analyst at the Small Business Development Center at Palm Beach State College in Boca Raton, Fla.
Until recently, Byron Udell, founder and chief executive of AccuQuote, a life insurance agency based in Wheeling, Ill., was spending several million dollars a year on pay-per-click campaigns. But after watching the price of keywords like “life insurance” rise to more than $20 from about $1 over the last 10 years, he decided to scale back greatly. “The cost to get someone just to visit your Web site has, in some cases, become prohibitive,” Mr. Udell said. “Something that cost $3 might be a no-brainer, but at $20 it becomes absurd. It’s basic math, and if it doesn’t add up, we won’t do it.” He said he planned to redirect some of his advertising dollars to print, television and radio. The increased demand for unpaid, or organic, search results has given rise to an entire industry specializing in search engine optimization, or S.E.O., with countless professed experts who promise to improve a Web site’s search ranking. As he looked for alternatives, Mr. Telford came across a number of companies like RhinoSEO, Marketo, Eloqua and Pardot, which sell online services that promise to automate a company’s marketing efforts and improve organic search results. The basic idea, Mr. Telford concluded, was that investing in social media content like blogs and Facebook pages could attract unpaid traffic. As a small-business owner without a full-time marketing staff, Mr. Telford wanted a tool that could help him manage both his social media content and his pay-per-click expenditures, which he planned to continue on a much-reduced basis. After conducting his research, he chose to sign up for the services offered by a company called HubSpot, which is based in Boston. Available online as software-as-a-service, HubSpot helps business owners set up a blog and optimize it to be recognized by search engines. The site, which has more than 8,000 customers, most of whom pay $200 to $1,000 a month, helps users populate and manage their Twitter, Facebook and LinkedIn accounts, along with any pay-per-click campaigns. It also tracks visitors and helps subscribers calculate the return on investment for their marketing initiatives. Even though Google is one of its investors, HubSpot cut back on its own pay-per-click expenditures after realizing that organic searches were accounting for 60 percent more traffic than paid searches. “Most of our paid efforts shifted to platforms like LinkedIn, where we could target for the right kinds of job titles in line with our target customer profiles,” said Dan Slagen, who is in charge of advertising at HubSpot. In March 2011, Mr. Telford started blogging through HubSpot about topics like where to find the best fishing holes, and despite fears of a devastating loss of traffic, he reduced his pay-per-click budget to $100,000. By the beginning of 2012, some six months after he began blogging roughly five times a week, his organic traffic was up 91 percent over the previous year. And the number of conversions, or visitors who took an action on the site, had increased 37 percent. 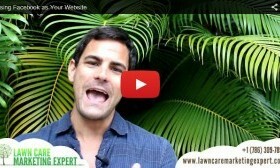 Using PPC for Lawn Care Advertising Pay-Per-Click (PPC) Advertising for Lawn Care Businesses – The Cold Hard Facts Keyword Research for Marketing Lawn Care Business Why is SEO So Important For Lawn Care Companies?